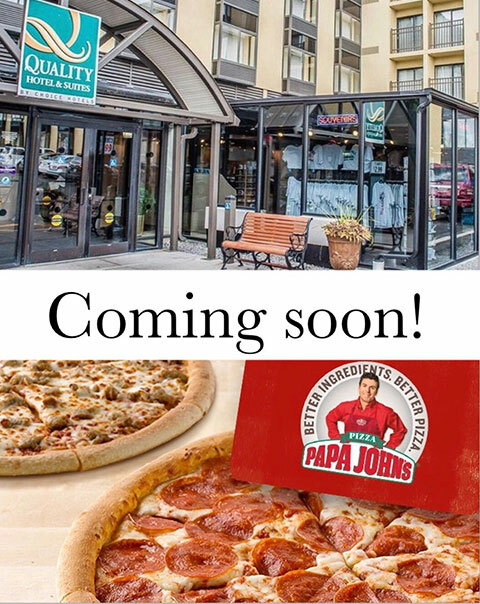 Papa John’s Coming Soon to Downtown Niagara Falls! - Quality Hotel & Suites "At The Falls"
Papa Johns Coming Soon to Downtown Niagara Falls! Papa Johns is coming soon to accompany The Quality Inn & Suites Hotel on 240 1st Street Niagara Falls, NY 14303. Papa John’s Restaurant is one of the largest pizza takeout and delivery chain restaurants. Known worldwide for their pizza, Papa John’s strives to give you the original taste of this Italian delicacy by using the best and freshest ingredients. The Quality Inn & Suites Hotel and the upcoming Papa John’s is located across the street from The Conference and Event Center, 5 minutes walking distance from The Niagara Falls State Park and 7 minutes walking distance from The Seneca Niagara Casino and Hotel. With many sites to see in Niagara Falls, you will now have a fast, convenient, and delicious food option to choose from right here at The Quality Inn & Suites Hotel. We hope you are just as excited as we are about this new update!